Hang onto your sewing machines, sew sisters... it's One Thimble time! 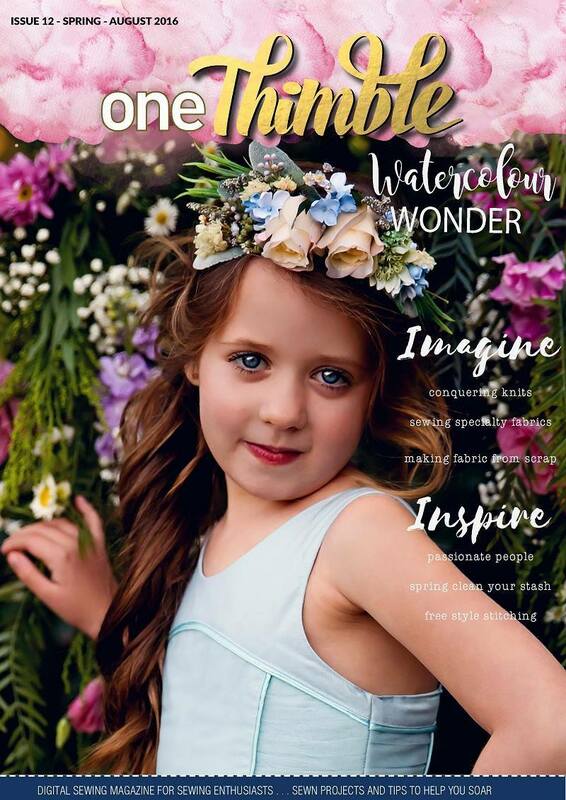 One Thimble, Issue 12 will be releasing soon- Hooray! 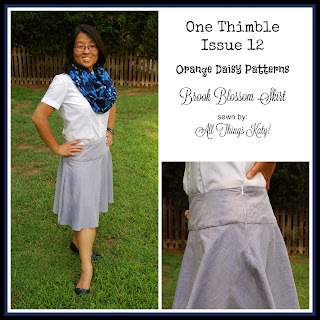 "One Thimble is a digital sewing magazine (e-zine) made by sewing enthusiasts for sewing enthusiasts! ...Issued quarterly, each issue of One Thimble includes PDF sewing patterns for projects that you can make and sell, as well as personal sewing stories, general interest and sewing technique articles, and tips for those running a handmade business." 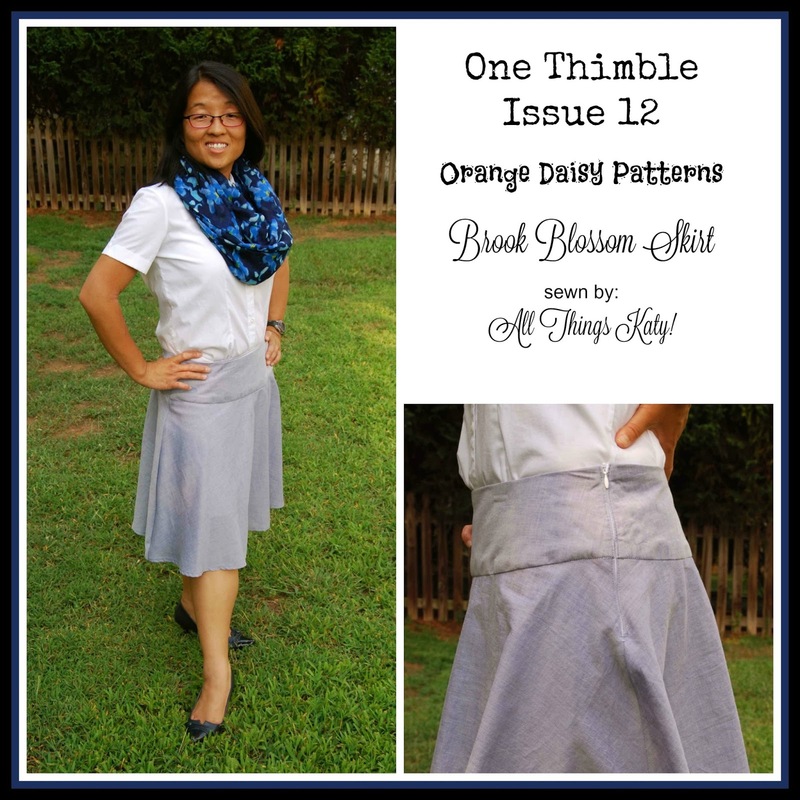 For my stop on the One Thimble, Issue 12, blog tour, I sewed up new-to-me PDF sewing pattern designer, Orange Daisy Patterns- Women's Brook Blossom Skirt. The Orange Daisy Patterns- Women's Brook Blossom Skirt is based on a half circle and it features a front and back yoke, and a side zipper. -The Orange Daisy Patterns- Women's Brook Blossom Skirt is written for sizes 00-20. -The Orange Daisy Patterns- Women's Brook Blossom Skirt is an INTERMEDIATE level sewing pattern. -The Orange Daisy Patterns- Women's Brook Blossom Skirt PDF sewing pattern includes layered, trimless pattern piece. That means that you only print the size you need and there is no extra trimming of pages needed!! One of my FAVORITE features in a sewing pattern! -The Orange Daisy Patterns- Women's Brook Blossom Skirt has three hem length options- knee, maxi and hi/low. -The Orange Daisy Patterns- Women's Brook Blossom Skirt is written for lightweight wovens- the pattern recommends, "...using Lightweight wovens with drape such as peachskin, chambray, bamboo rayon, silk and silk-like fabrics, etc..."
-The Orange Daisy Patterns- Women's Brook Blossom Skirt PDF sewing pattern includes a sizing chart, fabric requirements, tips to get the best fit, printing layout, printing guide and glossary. -The Orange Daisy Patterns- Women's Brook Blossom Skirt PDF sewing pattern features step-by-step, numbered written instructions, accompanied by shaded diagrams. 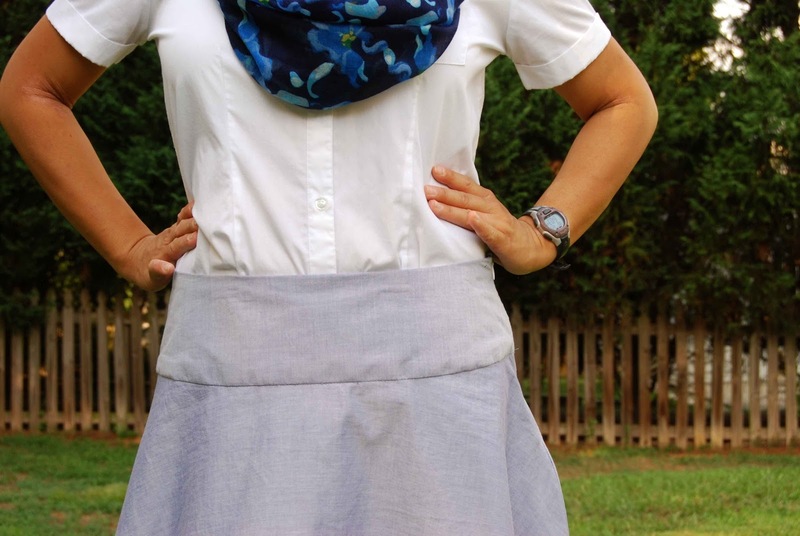 -The Orange Daisy Patterns- Women's Brook Blossom Skirt PDF sewing pattern includes both metric and imperial measurements. I sewed up a size six, view B (knee length), unlined Orange Daisy Patterns- Women's Brook Blossom Skirt. I used a lightweight chambray from my stash (originally purchased from the now-closed Hancock Fabrics... so sad!). I used an invisible zipper (the pattern does not specify what type of zipper to use). While the pattern is drafted for a 5'-5" tall woman, I did NOT alter the pattern to account for my short stature. 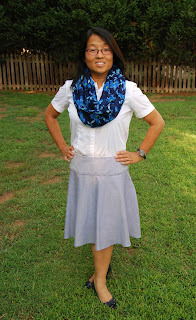 Instead, I wanted the skirt to be a little longer so that it would be (work) dress code appropriate. First off, my favorite part of the Orange Daisy Patterns- Women's Brook Blossom Skirt is the high quality, professional construction. 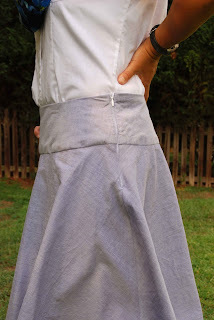 With the use of french seams, the inside of the skirt is as pretty on the inside as it is on the outside. I really felt like I accomplished something new and polished when I completed the Orange Daisy Patterns- Women's Brook Blossom Skirt. By consulting the sizing chart, I determined that a size six would be appropriate. The Orange Daisy Patterns- Women's Brook Blossom Skirt is, "...designed to sit just below the natural waist..." My size six ended up being much too large and too loose in the waist. HOWEVER, what I should have done (and I advise you to do so, too, before you sew the Orange Daisy Patterns- Women's Brook Blossom Skirt) is referred to the FINISHED WAIST MEASUREMENT chart on slide five. According to the FINISHED WAIST MEASUREMENT chart, I should have sewed up a size four (or, even maybe a two). Oh well- next time, next time... and there will definitely be a next time! Overall, I was really pleased with the Orange Daisy Patterns- Women's Brook Blossom Skirt. I learned a lot throughout the process and I'm really proud of the construction of my skirt. I love the flattering "flow" and shape of the skirt. The pattern pieces were easy to assemble. The Orange Daisy Patterns- Women's Brook Blossom Skirt can be dressed up, or dressed down! 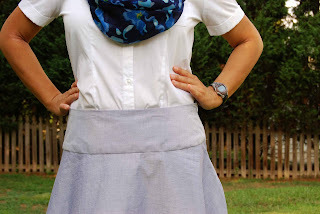 The Orange Daisy Patterns- Women's Brook Blossom Skirt is an enjoyable, satisfying sew that I'd be proud to wear! Thanks so much for sharing your experience of sewing this skirt.